Abby has decided that Murphy's Law is absolutely true. 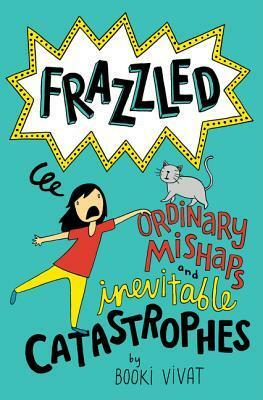 Just when she thought middle school would be somewhat okay (After Frazzled), everything starts to go wrong. Her sister Clara's cat, Felix, is out to get her, she has to come up with an idea for Invention Convention, and her locker has been taken over by a LOCKER THIEF. Luckily, just about the time that Abby is going to lose it right in the school hallway, the other person using her locker shows up. And she's in Abby's science class! And has to work with her on a project! Even though Abby DOESN'T KNOW HER! It's a new student, Jess, who is unperturbed and equanimous about the ordeal. Jess goes so far as to go to the office to calmly inquire about the situation. Even though the secretary admits there has been a mistake, there are no more lockers to be had, so Jess cleans out half the locker and blithely goes about her business. Abby, meanwhile, has focused her panic mode on coming up with an idea with Invention Convention. Eventually, she introduces Jess to her friends Maxine and Logan, and even invites Jess to Antonia's bakery. Shockingly, the world does not come to an abrupt and bloody end, and Abby even has the revelation that perhaps Jess is so unflappable because of her perception of events. Strengths: This is a quick, focused story that reluctant readers will breeze through, especially since there are more pictures than there were in the first book. Jess is a great example for Abby, and I'm glad that Abby calmed down a little. Invention Convention is one of the more stressful projects students do, and cats really are evil, so Abby does have a bit more basis in reality for the fears in this book. Weaknesses: Abby is not a likable character because she is so overly dramatic and makes many of her own problems. What I really think: I will definitely purchase this one. I talked over the summer to an incoming 6th grader who claimed she didn't like to read, and I handed her Frazzled on the first day of school. She can't wait to get her hands on this one!